Vendhaya kali .. Finger-licking…. Soooo good ! I like love vendhaya kali 🙂 I am addicted to this recipe from my childhood! When a healthy food is tasty too, why don’t you give a try ?! This calcium & iron rich recipe should be the wisest choice of any woman. Especially during Pregnancy and Lactation, this is a must for ladies as it provides the required nutrients for them. This kali is specially given to girls when they attain puberty to strengthen their hip bones. 1. 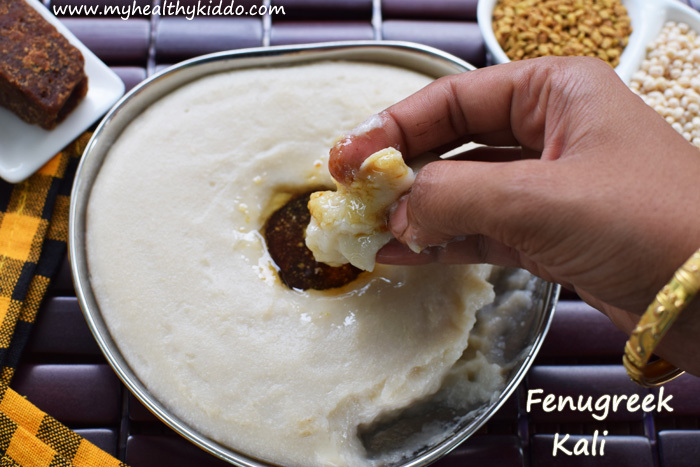 Soak Fenugreek seeds, Idli rice and Urad dal for 6-8 hrs or overnight. 2.First add fenugreek seeds to grinder and grind smoothly by adding required water. It took 15 minutes for me to reach creamy texture with no solids, as shown below 3.Then to the same batter in grinder, add soaked urad dal and idli rice. Add required water and grind well. 4.Add water in regular intervals. It should become a smooth batter with no hard texture. It took 15 mins in my grinder. 5.Once done, transfer grinder contents to a thick-bottomed pan. Add grinder washed water too. The mix should neither be too watery nor be too thick, rather it should be pourable. Add some salt and mix well. 6.Cook for first 5 mins in high flame and the next 15 mins in medium high flame. Keep stirring. The final consistency should not be too thick as kali will thicken over time. 7.Finely crush/grate jaggery with no lumps. I used my ammi to crush. 8.Transfer kali to a serving plate. Dig a well in the center and add jaggery to that. Pour required sesame oil over jaggery and mix well. Serve warm! Take a lil portion of kali, dip it in oil-soaked jaggery and enjoy the healthy and tasty kali ! 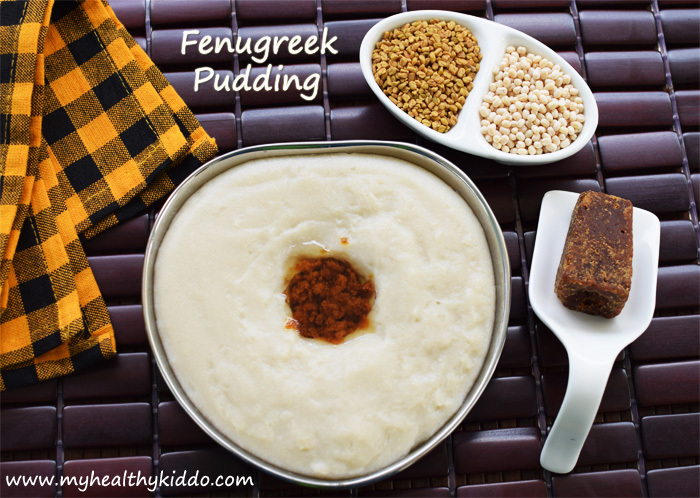 You shall soak idli rice and urad dal together in the same vessel, but fenugreek in a separate bowl. The ground batter should not be thick like idli batter. While grinding, do not worry if you add more water, as kali will anyways thicken while cooking. If you like the flavor of fenugreek, do add the measure specified for strong flavor. If trying for first time, do opt for mild flavor. Try to develop this taste for kids. First time, do not give in oil-soaked jaggery as many kids might not prefer raw oil taste. Start with kali and plain jaggery syrup combination and gradually include sesame oil. Hi mam.. I tried your recipe. It was testing great 🙂 thank you!! I am planning to try your Sambhar powder recipe.. Can you give the measurement in standard cup size? @Vidhya, Thank you. I have updated Sambar powder recipe ingredients box with cup measurements now. Pls have a look, try and let me know the outcome ..